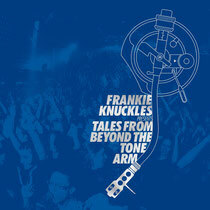 Frankie Knuckles tells us exactly where he is at musically through new album ‘Tales From Beyond The Tone Arm’. Now a household name in music, Frankie Knuckles is the man who is famously credited as being the ‘Godfather of House Music’. It was at his Chicago nightclub in the late-70s - ‘The Warehouse’ - where he would take the ultimately danceable beats of disco and subtly evolve them into what we now know as house. With a multitude of impeccable artists he has put together his aptly titled new album ‘Tales From Beyond The Tone Arm’, a kind of ‘concept’ compilation album that takes you through Frankie’s most recent productions, collaborations and musical experiences. This new compilation album is split into two moods. ‘The Classic Side’ (CD1) is full of tracks that are reminiscent of the halcyon days of house music back in the early-90s, including Frankie’s own celebrated re-work of “The Whistle Song” under his Directors Cut moniker along with long time production partner and house stalwart Eric Kupper. ‘The Soultronic Side’ (CD2) brings it all forward, fusing soulful sounds from Inaya Day & Robin S. (‘Right Now’) with newcomers such as Colton Ford (‘Let Me Live Again’) and young producers and remixers like Rober Gaez and Belocca & Soneec. The album also includes an array of exclusives cuts from the likes of Sybil (‘Let Yourself Go’) and Inaya Day and Robin S. (‘Right Now’). It’s out November 12.